Jamie Walker would love to be part of a Hearts team that could recreate the buzz of the famous 2005/06 season. If the Jambos win at home to Motherwell tonight, it will be the first time they have opened a top-flight campaign with three successive wins since George Burley’s swashbuckling team took Scottish football by storm a decade ago. Walker was a starry-eyed 12-year-old fan – albeit part of the club’s academy – back then and remembers vividly the sense of excitement among the Hearts support as they won their first eight games before Burley was sacked by Vladimir Romanov in October. The 22-year-old attacker is not for a second suggesting that the current team is at the same level as that one. But, with the next four games against sides from last season’s bottom six – Motherwell, Ross County, Partick Thistle and Hamilton – he is hopeful of at least building up a head of steam and ensuring they are flying high in the league by the time they face last season’s top three – Inverness, Aberdeen and Celtic – in consecutive matches next month. “I was there watching them that season under Burley,” Walker told the Evening News. “I was on the books at Hearts and I used to get tickets from [current scout and former academy director] John Murray and sit in the Roseburn Stand. That was some team and they went on to finish second and won the Scottish Cup against Gretna. Rudi Skacel was brilliant, scoring every week at the start of the season and the gaffer [Robbie Neilson] was playing as well. “The fans were really excited with what was happening then, but Burley got sacked and that put a bit of a downer on it. The team then pulled together and still got second place. I remember being at Tynecastle when Paul Hartley scored against Aberdeen to secure the Champions League place. It was a great season. “We’ve got a bit to go until we get to the level of that team, but if we keep picking up three points, the expectation gets higher and higher. We’re just looking to beat Motherwell and if we win that, then we’ll look to beat Ross County at the weekend. Hearts have had to overcome some sticky moments in beating St Johnstone and Dundee in the first two games. Walker believes that the winning mentality nurtured during last year’s surge to the Championship has helped them eke out six points while not at their best, and the attacker is optimistic that his team’s play will soon become slicker. “We’ve had two good results against teams that finished in the top half last season so it’s been a good start,” said Walker. “But we conceded three goals against St Johnstone and the first half against Dundee wasn’t acceptable, so we know we’ve got a lot to work on. 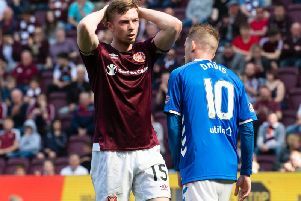 Walker, one of the few Hearts players to enjoy an uninterrupted pre-season, has made a bright start to the campaign and looks ready to build on his fine form in the Championship. “I got off to a good start against St Johnstone, scoring one and setting one up for Callum [Paterson],” said the academy graduate, who has been utilised both as a winger and a No.10. “I should have scored against Dundee as well and I’m taking the one against Arbroath [in the League Cup, which went down as own goal] – the defender never even touched it. Walker is one of those expected to remain in the starting XI against Motherwell tonight, even though Neilson is likely to make one or two changes to freshen things up. The head coach rarely fields the same line-up two games running and explained that this is a deliberate ploy to ensure those who don’t feature quite so regularly are still up to speed when called upon. Neilson, meanwhile, defended his team selection from the Dundee game in the wake of a suggestion from radio summariser and former Aberdeen manager Willie Miller that he had been guilty of “overcoaching” by trying to accommodate centre-back Alim Ozturk in a midfield holding role. After a difficult first half, Hearts reshuffled to a more conventional set-up and won the game.